When and where did humans split from the apes to become a separate branch of bipeds? Are we an ape or not? If so, which of the living Great Apes is the closest to humans? European philosophers and scientists have debated questions like these for more than three centuries. From the pre-evolutionary musings of sixteenth century Dutch anatomists like Nicolaes Tulp and eighteenth century naturalists such as Carl Linnaeus, to the father of evolutionary biology, Charles Darwin, and his successors, Western scholars have long pondered where among the living primates humans belong. The careful and detailed dissections of Great Apes and humans done by ‘Darwin’s bulldog’, T.H. Huxley, in the late nineteenth century seemed to reveal that gorillas and chimpanzees were physically more alike than either species was to humans. This also squared with the view that humans were very distinct from the other African Apes, having evolved for longer, and perhaps at a faster rate, to obtain highly distinctive features like our upright posture, bipedal locomotion and big brains. Still, Huxley’s work made it starkly clear that humans were a Great Ape, closer to our African kin than our East Asian ape cousins, the orangutan. It was unclear, however, which of the hundreds of extinct ape species found during the nineteenth and twentieth centuries in Africa, Europe and Asia, dating from the period 10 million to 35 million years old, gave rise to the human lineage. By the mid-1960s this seemed to be solved. David Pilbeam of Harvard University argued that Ramapithecus, a 14 million year old ape from the Siwalik Mountains of Pakistan, but also found in East Africa, was the earliest member of the human line. It was even suggested that humans had split from a common ancestor with the African apes by about 30 million years ago, making our evolution a very long process indeed. Coincidentally, at the time Ramapithecus was being touted as the first human ancestor, pioneers of the nascent field of molecular biology were beginning to compare blood proteins among different mammals, including humans and apes, to study their evolution. Their findings were poised to cause a major upset among anthropologists, and would come to set the framework for understanding the origins of the human branch until today. Emile Zuckerkandl and twice Nobel Prize winner Linus Pauling were among the many workers studying haemoglobin, and were interested in differences between humans and the gorilla. They found that the differences between the two species were mostly the result of ‘neutral’ mutations, or genetic changes with little or no consequence for the functioning of blood proteins themselves. The neutrality of these mutations meant they could be used as a yardstick of evolutionary distance – the more mutations accumulated, the longer the time since the species split. Neutral mutations were also found to occur with enough regularity to provide a kind of ‘molecular clock’; which is today used across the entire tree of life to give evolution a time frame. Although the molecular clock is now a well established tool in evolutionary biology, it is not without its controversies or detractors. It isn’t as accurate as the geological clocks used routinely to date rocks and fossils by geologists, although, they also have their uncertainties of course. And, rather cleverly, modern molecular clocks use dated geological events as a kind of reference or standard against which to calibrate evolutionary time, especially the ‘tick rate’ (or mutation rate) of the clock itself. With the advent of ancient DNA sequencing, we can even study clocks in extinct species and get a handle on whether its ticking rate has changed over time. These first molecular clocks suggested humans and gorillas had separated only around 11 million years ago, not 30 million as suggested by fossils like Ramapithecus. Surprisingly, this date is remarkably similar to even the most recent molecular clock estimates as well as the latest fossil discoveries, as we shall see later, indicating gorillas diverged between 8.5 and 12 million years ago. Incidentally, once the bony face of Ramapithecus was unearthed from the fosil record of Pakistan in the early 1980s, the human status of this ape was quickly reassessed. When it comes to studying Great Ape evolution, especially chimpanzees, we have so little to go on from the fossil record that we have no choice but reply heavily on genomic evidence. As it turns out, everything we know about chimp evolution has been garnered from their genomes: the common chimpanzee (species: Pan troglodytes) had its genome sequenced in 2005, while the bonobo (species: Pan paniscus) only had its genetic code fully read in 2012. So far, we’ve found just three fossil teeth for the entirety of chimpanzee evolution, and they’re a mere 500,000 years old. As I noted earlier, Huxley’s dissections in the late 1800s established the closeness of humans to chimpanzees and gorillas. But, for a good portion of the twentieth century, the precise branching arrangements of the African ape tree – whether humans were closest to either of the apes or sat out on our own – were contested. It wasn’t until the year 2000 when this was finally resolved by molecular biologists: humans and chimpanzees were shown to share an ancestor after gorillas had gone their separate evolutionary way. Following the sequencing of the complete human and chimpanzee genomes by 2005, geneticists showed that we share around 99 percent of our DNA, firming up our closeness. In 2000, along came Orrorin tugenensis and Sahelanthropus tchadensis, fossils that appeared to belong to the human line, and dated between 6 and 7 million years old. Most molecular clocks at the time, and many since, put the split between humans and chimpanzees at only around 5-6 million years ago. But now the fossil record had pushed the date back, and so the molecular clocks would need to be rethought. Some geneticists and anthropologists argued against Orrorin, Sahelanthropus and another group, Ardipithecus, being in the human branch on the grounds that they were too old and their similarities to humans explainable in ways other than shared ancestry. While most anthropologists currently welcome them as pre-humans, there continue to be high profile sceptics, and opinions can change quickly with new evidence. Still, truth is we have so few fossils in the window of 4 million to 12 million years ago that we’re a long way from having a clear sense of when and how gorillas, chimpanzees and humans split from each other, and the emergence of the human lineage itself. The human fossil record gets a lot denser from about 4 million years onwards. Enter Chororapithecus abyssinicus: found by anthropologists excavating in Ethiopia during 2006 and 2007. This species seems to belong to the gorilla line, and new research published in the journal Nature by Shigehiro Katoh and a large international team has confirmed the age of the species to be 8 million years old. 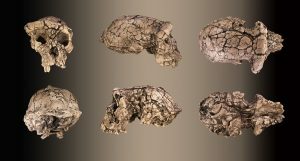 Another fossil probably belonging to the gorilla branch is Nakalipithecus from Kenya, found also in 2007, but dated to about 10 million years old. These fossils together constrain the age of the gorilla versus chimpanzee-human split to between 8 and 10 million years ago, well within the range of estimates from molecular clocks. Big tick for the molecular clock. What might this mean for Sahelanthropus, Orrorin and Ardipithecus regarding our understanding of the human lineage? Well, if these groups are indeed early humans, then the human-chimp ancestor must have formed very quickly, and just as quickly split to begin the human line; all within 1 or 2 million years. Alternatively, if the detractors are correct, and Sahelanthropus, Orrorin and Ardipithecus turn out not be human, then there’s a huge chunk of time, 4-6 million to be precise, for these events to occur, and an even bigger gap in knowledge of our past. Perhaps the more remarkable thing about of all about this is just how similar the dates for Chororapithecus and Nakalipithecus are to the pioneering estimates of Zuckerkandl and Pauling, published way back in 1962 using their crude protein clock. That’s a remarkable achievement in itself and testimony to the enduring role molecular clocks have played in evolutionary biology, as well as hinting at a few lessons we might just wish to take on board from history. This entry was posted in Evolution, Science. Bookmark the permalink.